[Performance Event] National Gugak Center: Korea's Musical Traditions on Stage The Korean Cultural Centre and the Embassy of the Republic of Korea proudly present <National Gugak Center: Korea's Musical Traditions on Stage> taking place on Friday, September 14, 2018, at 7 PM (Doors Open 6:45 PM) at the Canadian Museum of History Theatre (100 rue Laurier, Gatineau, QC). - Date: Friday, Sept..
<구글 번역> 오타와 공중 보건 문제 동상 자문 오타와 공중 보건부 (Ottawa Public Health)는 오타와 지역에 대한 동상 진술을 발표했습니다. 화요일의 최고치는 -12 C이지만, 바람에 시달리는 바람에 -24처럼 느껴집니다. 오타와 공중 보건부 (Ottawa Public Health)는 냉기 온도가 -25에 도달하면 동상 동상을 발표합니다. 서리 내릴 경고는 바람이 서늘해질 때가 -35 이하로 내려갈 때 또는 눈보라 또는 얼음 폭풍..
One of the most highly anticipated spectacles coming to Ottawa this year is La Machine. In a North American first, a fire-breathing wood-and-steel dragon weighing 45 tonnes and a 20-metre long mechanical spider will roam the streets of Ottawa in a four-day-long free street theatre event. The dragon is a reference to Ottawa’s sister city, Beijing, while the spider recalls the famous metal arach..
Know your rights: Door-to-door sales require licence from the cityBY JON WILLING, OTTAWA SUN가정 방문 판매를 하는 세일즈맨들은 오타와 시에서 발행받은 허가증을 가지고 있어야 한다는 기사입니다. 물건이나 여러가지 할인상품을 판매하려는 이들을 검증하는 방법이기도 합니다.Next time someone bangs on your door asking you to buy something, ask to see a licence.The City of Ottawa has a bylaw..
Come play at Snowflake Kingdom! Come and enjoy Jacques-Cartier Park in Gatineau. Snow slides, magnificent snow sculptures, maze, mega zipline, dogsledding, digital art projection, shows and plenty more activities await you! Guaranteed fun in this huge winter playground! The Ice Hog family, beloved mascots of Winterlude, can also be found at the Snowflake Kingdom. The Ice Hog family lives he.. Mature Students Could Qualify for Free T..
Ministry of Advanced Education and Skills Development, on January 17, 2017Ontario is transforming student assistance to make college and university more affordable, including free tuition for qualifying adult learners, so that they can go back to school and upgrade their skills.Deb Matthews, Minister of Advanced Education and Skills Development, joined by Education Minister Mitzie Hunter met with .. Statement by the Prime Minister of Canada on Korean New YearJanuary 28, 2017 The Prime Minister, Justin Trudeau, today issued the following statement to recognize the Korean New Year, also known as Seollal: “This week, Korean communities in Canada and around the world will celebrate Seollal and welcome the arrival of the year of the Rooster. “Seollal is the most important traditional Korean h..
Three reasons you should really clear that snow off your car 차 위의 눈을 치워야 하는 세가지 이유 You're putting yourself and others in a lot of danger by not clearing your car of snow and ice What’s the condition behind the almost universal attraction for drivers to watch snow blow off their cars and trucks as they head out on winter roads? Is it something akin to a child’s fondnes..
캐나다 헌법강의 안녕하세요! 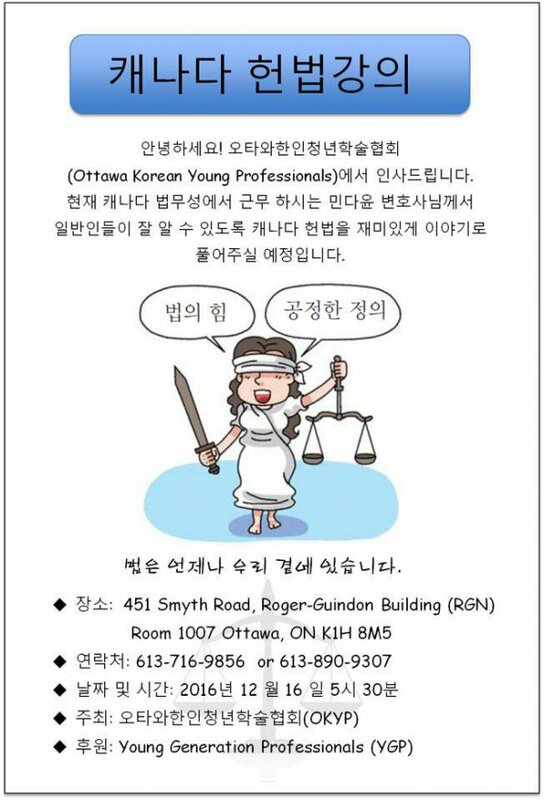 오타와한인청년학술협회(Ottawa Korean Young Professionals)에서 인사드립니다. 현재 캐나다 법무성에서 근무 하시는 민다윤 변호사님께서 일반인들이 잘 알 수 있도록 캐나다 헌법을 재미있게 이야기로 풀어주실 예정입니다. 헌법은 언제나 우리 곁에&nbs..
교회 단톡방에 올려진 내용을 나눕니다. 교회분들중 영주권을 진행하시는 분들이 계서서 혹시 아시나 해서 올려봅니다. 이번에 이틀전 canada gazette에서 변경된 express entry에 대한 공지가 떴네요. 주된 내용은 LMIA 가산점과 캐나다 대학 졸업생에게 주는 가산점 변경에 대한거네요. 혹시 필요하신분들은 검색하시면 자세한분석들이 나옵니다.